Do you know how old the oldest bonsai tree in the world is? That question evokes thoughts and debates which, to some extent, are quite fanciful, subjective and even fictional. As a bonsai enthusiast, I sometimes wonder whether the bonsai community has found out and honored such the oldest tree. And, therefore, I try to find an acceptably reliable answer to that query. In practice, we all know that bonsai trees are miniature plants. With relatively similar sizes, a very aged tree may look almost the same as a younger counterpart. So it’s not easy to know the exact age of tree, let alone tell which one is the oldest bonsai tree. Usually experienced bonsai masters, based on their own experience, estimate or guess the age of a bonsai tree by traditional ways based on tree species, trunk’s diameter, internode, bark, etc. That estimation is surely subjective or even biased, and cannot provide reliably precise age of old trees. 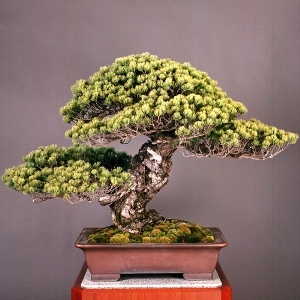 Scientific techniques, on the other hand, can provide completely accurate result, but are usually costly, impractical, and may be damaging to the bonsai trees. What do you think if we need to cut down the tree to count the rings at the base of the trunk? Terrible, isn't it? Owners of old trees may keep record or historical document regarding the trees’ origin. But they do not always want to show. By that reasons, many really old bonsai trees are believed to be kept in collections of many traditional Japanese gardens or somewhere else, which are not accessible to public. With such information restriction, the only thing bonsai lovers can do is trying to find out and honor the oldest bonsai trees that are still living and publicly known to the community. Other aged trees, if any in existence, will be considered as kind of myths until they are brought to public. In below part, I’ll talk about the oldest bonsai tree in the world, both in reality and also in myths. Many sources believe one of the oldest living bonsai tree is a five-needle pine known as goyomatsu (Japanese white pine). The tree is in the Tokyo Imperial Palace collection and considered a National Treasure of Japan. About 550 years old, and 81 centimeters high, the tree is honored the masterpiece of masterpieces. Its stable form, powerful trunks and good balance with the container carry a sense of history and nature. It is a large bonsai. According to the Kyodo News, there are no rivals for the ancient-looking tree. The oldest bonsai tree in imagination or in unchecked reality is much older than the above pine tree. Listed below are several myths about bonsai trees over a thousand years old. These are alleged information without supported documents or photos. I collect them mainly for fun. Hope you also enjoy them. In the center of this tomb was a pedestal made of solid gold and on top of it was a remarkable, though slightly unkempt, pine bonsai planted in a highly decorated and jewel encrusted pot filled with soil that consisted of thousands of small diamonds, dusted with what appeared to be bat dung. Rays of sunlight illuminated it from many angles, reflecting off of polished mica and originating from a small hole in the rock outcropping, also lined with plates of polished mica. A stalagmite directly above the bonsai dripped mineral rich water slowly but steadily onto the tree, washing any bat dung on the foliage into the diamonds below. Upon study, scientists dated the pottery that held the pine at app 1000 years BC, making it over 3000 years old! Some say that such a tree could never survive that long; others claim that the constant water and nutrient sources, coupled with controlled sunlight could have worked. Some say the tree would have died due to being root bound and become horribly overgrown; others claim the root restriction and the diamonds prevented this from happening. Experts have known for years that bonsai trees, when cared for properly, can live a very long time. However, when you talk about an old bonsai tree, archeologist from the University of Chicago made an incredible discover in 2000. While working with the government of Tibet and exploring many of the ruins of the ancient Tibetan monastery, they found what is believed to be a 1,500 year old bonsai tree. Through in-depth testing, the monastery was estimated around 3,000 years old although 1,500 years ago, it was virtually destroyed by a major earthquake. As the archeologists walked into one particular room that had not been damaged, there in the center on a display table was a living, breathing 1,500 year old bonsai tree. As you can imagine, they were both shocked and overwhelmed. It is not every day that someone walks into a ruin in Tibet to discover a 1,500 year old bonsai tree, just sitting there, as if waiting for their arrival. As the archeologist studied and surveyed the tree, they speculated that with just a small ray of sunlight coming into the room for just two hours a day, and absolutely no human intervention, this one lone tree had somehow survived. The next speculation about this 1,500 year old bonsai tree is that for nourishment, the tree survived on insect remains and bat droppings. However, as the archeologists looked around the room further, they also discovered that a nearby spring provided the tree with just a few drops of water every day, just enough to keep its soil moist. Can you imagine – a 1,500 year old bonsai tree, in the middle of Tibet, all alone! This discovery was remarkable, simply an impossibility yet it happened. Archaeologists recently discovered the world's oldest living bonsai dating back at least 3600 years. The potted pine was found in central China, standing vigil over the tombs of the fourth emperor of the Shang dynasty and his queen. The 41 cm high tree stood in a solid gold pot which was itself set on a solid gold pedestal some 75 cm high. A fine dripper arrangement had been built into the stone roof of the tomb complex, allowing a single drop of water to fall onto the tree every single minute. The tree, in absolute darkness for more than three and a half millenniums, was chalk white, having lost all its chlorophyll. The continuous action of falling water has washed away all the soil in the pot leaving only the drainage layer of diamonds. The dense roots were as white as the pine needles. This tree, which is almost as old as the great Egyptian pyramids might well be classified as one of the wonders of the natural world."